Black plum (Wumei)-Prunus mume (Sieb.) Sieb. et Zucc. Botanical Name: Prunus mume (Sieb.) Sieb. et Zucc. Part Used & Method for Pharmaceutical Preparations: The unripe fruit is gathered in the period at the Beginning of Summer (seventh solar term). It is baked at a low temperature until the skins turn black. The plum stone is removed. 1. Chronic cough due to deficiency of the lungs. Black plum (Wumei) is used with Poppy capsule (Yingsuqiao), Donkey hide gelatin (Ejiao) and Apricot seed (Xingren). 2. Chronic diarrhea or dysentery. Black plum (Wumei) is used with Nutmeg (Roudoukou), Chebula fruit (Hezi) and Poppy capsule (Yingsuqiao). 3. Acute dysentery. 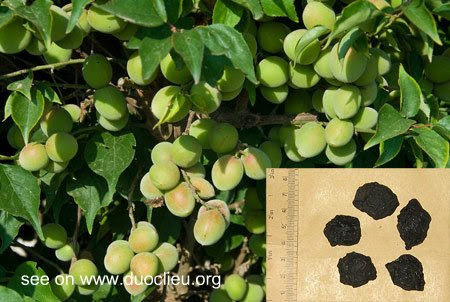 Black plum (Wumei) is used with Coptis root (Huanglian). 4. Diabetes. Black plum (Wumei) is used with Trichosanthes root (Tianhuafen), Ophiopogon root (Maidong), Ginseng (Renshen) and Pueraria root (Gegen). 5. Roundworms in the biliary tract manifested as abdominal pain, nausea and vomiting. Black plum (Wumei) is used with Asarum herb (Xixin) and Coptis root (Huanglian) in the formula Wumei Wan. Cautions & Contraindications: This herb is contraindicated in cases with exterior syndrome or accumulation of excessive heat in the interior.